Logical Operations Electronic Training Bundle is preferred by instructors and students alike because of its superior instructional design, complete mapping to exam objectives, and the availability of supplemental content in multiple modalities created using single-source development. Logical Operations Electronic Training Bundle, available exclusively through Logical Operations, provides access to an electronic "e-Book" version of the instructor-led training (ILT) courseware; interactive resources designed to reinforce course material; HTML versions of the ILT courseware for any mobile device that supports a web browser; and detailed assessments designed to identify competency gaps and validate comprehension. For best success in this class, you will need a strong knowledge of networking and IP addressing concepts, as well as IT network management experience that includes: implementing LANs, Internet connectivity, and IPv6; and managing and securing routers, switches, and other network devices. 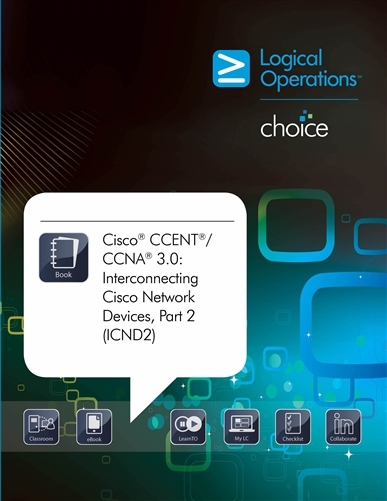 You can obtain this level of knowledge and skill by taking Logical Operations' course; Cisco CCENT/CCNA 3.0: Interconnecting Cisco Network Devices, Part 1 (ICND1). In addition, Logical Operations' course, CompTIA Network+ (Exam N10-006)(or the equivalent certification), is highly recommended.